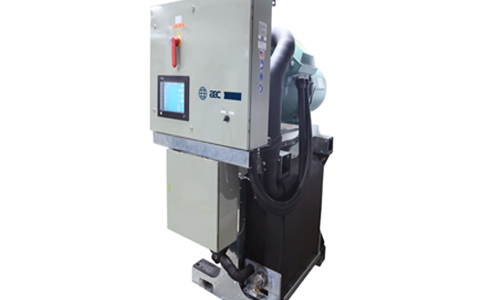 AEC, an ACS Group brand and manufacturer of auxiliary equipment for the plastics industry, introduced the latest addition to their popular chiller series products, the Trident GS Series Central Chiller at NPE 2015. Each individual Trident circuit utilizes proven dual screw compressor technology while offering an advanced operator panel for intuitive chilling system control. 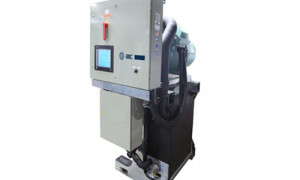 TS Tech, AEC’s integrated tool-less strainer technology, allows for rapid maintenance while enhancing the uptime of each chiller circuit with its larger strainer surface and easy access. Combined with integrated Schrader valves for simple service connection and refrigerant recharging, the company said the Trident is one of the easiest to maintain central chilling systems available on the market today. Individual circuits range from 50 tons to 120 tons of chilling capacity and users can parallel up to five circuits for a maximum of 600 tons of chilling capacity. After the refrigerant and water lines have been installed, the addition of a drone circuit is simply plug and play. As each circuit contains all of the necessary components and programming to take over as the master unit at any time, the time for integration and setup is reduced. Pump tanks are also easily integrated in the system. A full suite of electronic sensors with digital readout include leaving and entering fluid temperatures, compressor suction pressure, compressor discharge pressure, condenser inlet temperature, superheat, sub-cool, pump pressure and tank level. “Adaptive control” is provided for monitoring the conditions of the chillers, where the operator can adjust the operation of certain components with the chiller approaches an alarm condition. All GS Series chillers, available in remote air and packaged water-cooled models, offer a leaving coolant temperature range of -1°C to 18.3°C.